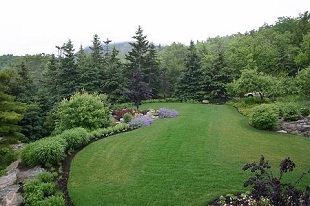 Coastal Maine landscape contractor, Gordon Robb Landscaping, Inc. has sculpted many of the most beautiful landscapes in Maine, from Winter Harbor to Mount Desert Island (MDI), Blue Hill, Brooklin, and Castine. 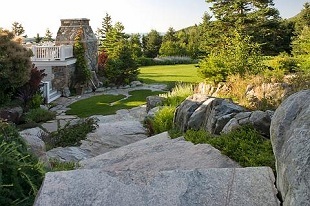 In fact, if you drive through Down East Maine it is unlikely you can choose a path that will not take you near a Gordon Robb Landscaping project completed in collaboration with some of the most acclaimed landscape architects and building contractors in New England. 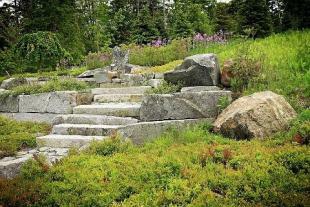 If you happen to be in the Boothbay Harbor area, visit the Maine Coast Botanical Gardens to view some of Robb’s work. Through our 32 years creating Maine landscapes we have operated our business with integrity, fairness and respect for our employees, customers and the properties where we work. The process of working with the architect, the customer, and nature is what we love and we have mastered this collaboration allowing us to participate in the creation of many beautiful new environments. From healing new construction sites to extreme makeovers, Gordon Robb Landscaping will create a landscape of beauty and usefulness that will last for generations. The look of distinction that natural stone, pavers and outdoor structures add to any landscape is undeniable. 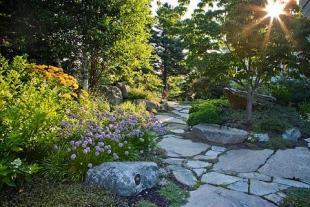 Hardscapes which compliment the natural environment create a sense of purpose and refinement to any property. When designed with vision and installed with flair, hardscapes create permanent and practical functionality while expanding your outdoor environment. Each hardscape we create is unique, created in combination with color, texture and dimension, bringing one-of-a-kind elegance to the finished project. It is our belief that the employees of Gordon Robb Landscape are the most valued assets of our company and the reason for our success. Most of our employees have been with us for many years and we think of them as family. We work hard to cultivate a creative and positive environment where they can succeed in accomplishing their goals and hope that our clients will benefit from the award-winning results of our efforts.